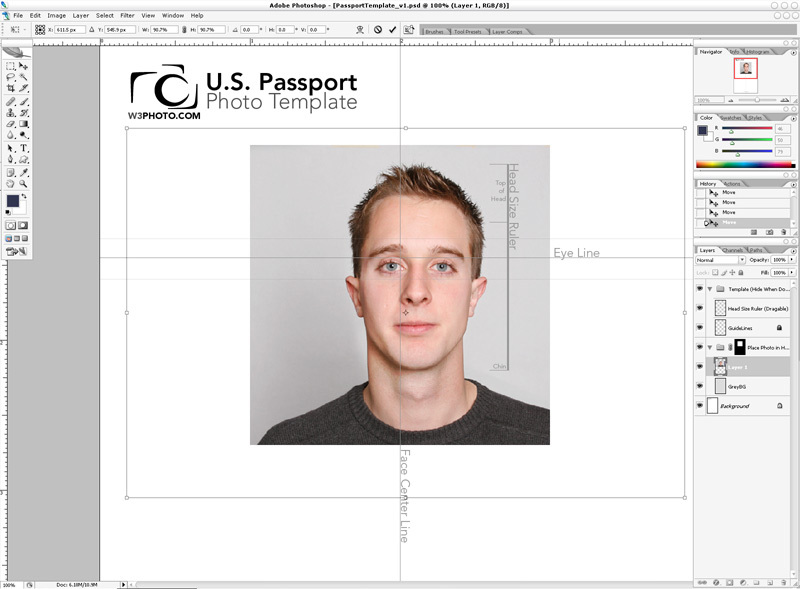 The purpose of this template is to simplify the creation of two 2×2 inch photos required for the U.S. passport application. When used correctly, photos processed with the template meet sizing requirements as denoted by the U.S Department of State. This template was designed to speed up the sizing process, and produces a document that can be printed on your home computer or at a local photo lab. 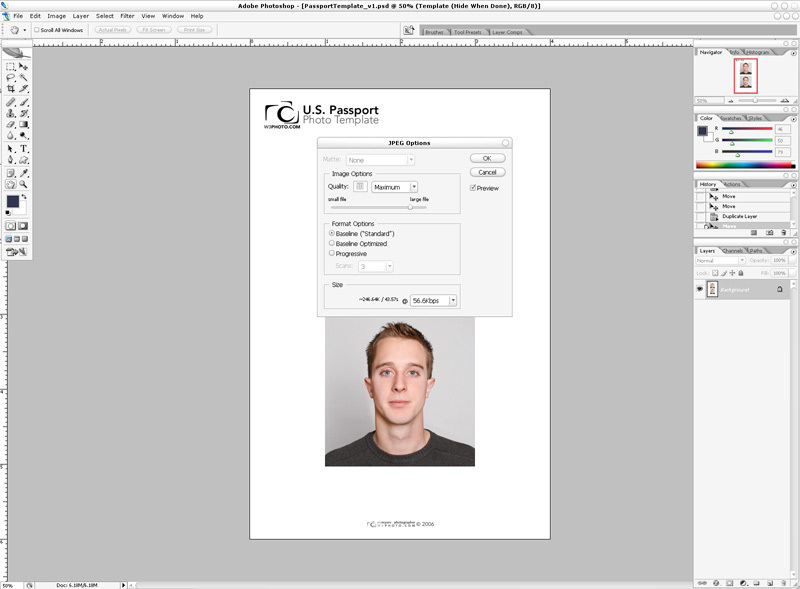 Photos processed with this template have been accepted for use in U.S. passport applications. 1. 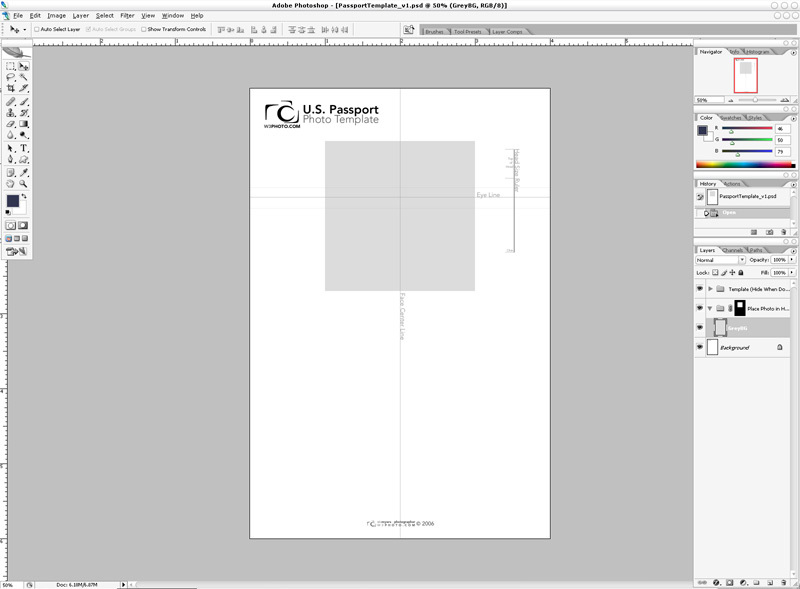 Open PassportTemplate_v1.psd in Photoshop. 2. Open photo to be used as passport photo in Photoshop. To take a photo that meets background and composition requirements read over the U.S Department of State guide located at http://travel.state.gov/passport/guide/guide_2081.html. 3. 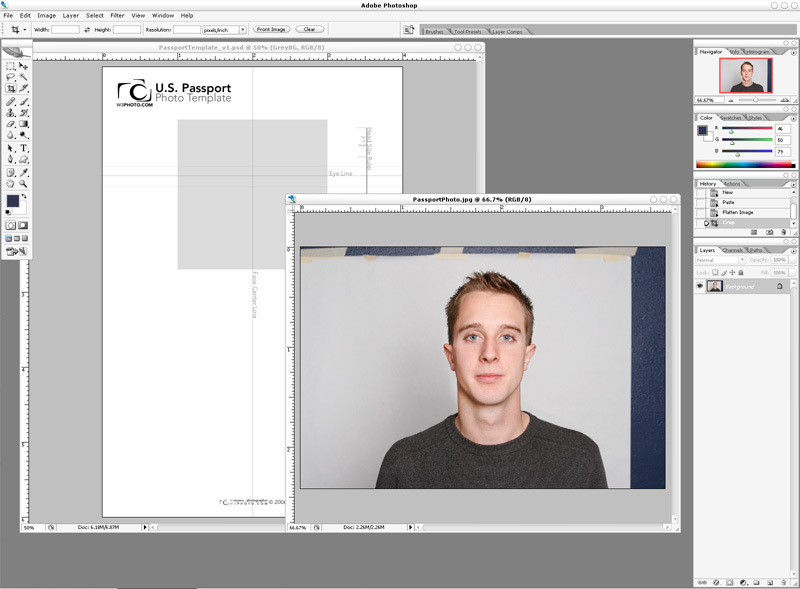 Drag passport photo into the template and position layer directly above GreyBG in the layer group entitled Place Photo in Here Above GreyBG. 4. 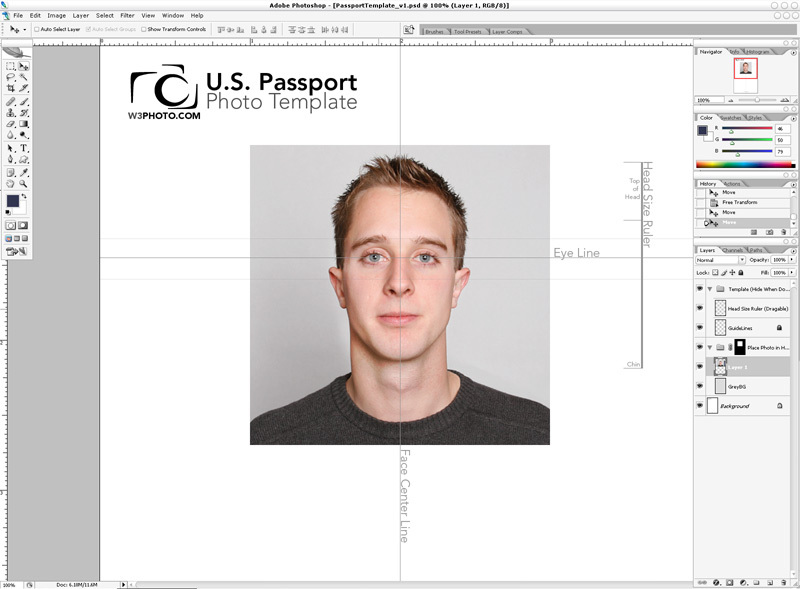 The first step is to size the head in the photo using theHead Size Ruler Using Free Transform (CTRL-T), re-size the photo so that the head falls within the confines of the ruler. The ruler is drag-able using Photoshop’s move tool, so if its not positioned in a useful place move it to an area that helps you. When you’re done with the tool, feel free to move it off the image. 5. Horizontally center the photo using the vertical Face Center Line as a guide. If necessary, rotate your image. The Face Center Line guide should be equally dividing your face. 6. Using the Eye Line as a guide, vertically center the photo making sure that the eyes fall within the middle of the two outside lines, and if possible close to the center eye line. 7. Duplicate the layer group titled Place Photo in Here Above GreyBG, and drag it to a new position that is not covering the original photo. 8. Hide the Template layer group. 9. Save the resulting document. The options are up to you, but .JPG with a compression of 10 will work fine for most purposes. If you wish, you could also save the .PSD so you can make corrections at a later date if required. 10. Print the photo on 4×6 paper via your inkjet with photo paper (if your printer produces good quality photos), or print it using a photo lab. Any lab that prints 4x6s will work, which is pretty much all of them. 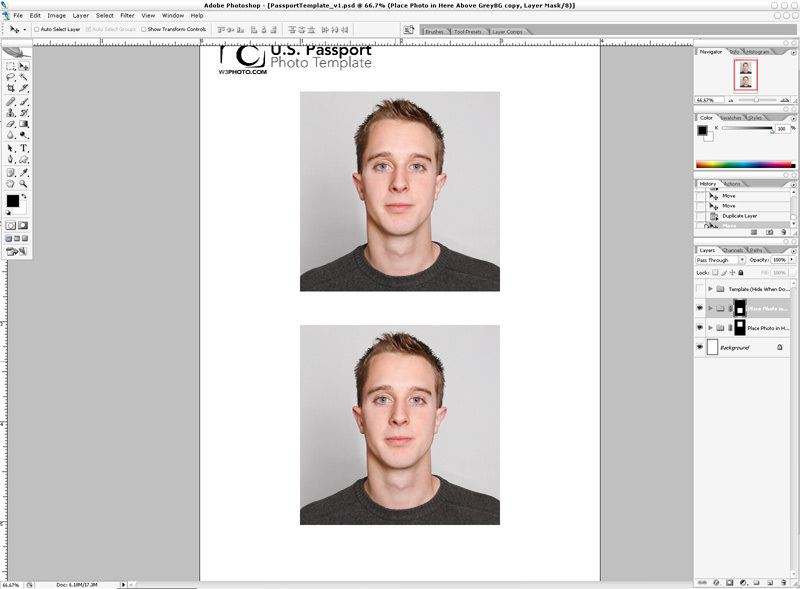 These photos are incredibly useful when traveling, you will use them on every thing from visa applications to identification cards. I highly recommend bringing at least 10 extra photos with you for any overseas trip. 11. Cut the photos out. I hope you find this template and tutorial useful. The template has been downloaded and used by thousands of people. If you compare the amount charged by a typical location such as Kinko’s or USPS, I estimate that the collective savings from everyone using this template is well over $20,000. If you found this template useful, please tell your friends about it. If anyone has questions about how to use the template, please use the comment system below. As I don’t have a lot of time to offer personal support for the non-commercial license, I hope the community of people using this can help each other out. I thank everyone for making this template a success. Hey thanks for the template…..works very nicely. Template worked for me with Elements 9. Thanks so much! No wonder that this template is so popular; it’s perfect. Instructions are clear, and the photos come out great. Thanks for taking the time to put this together, and for sharing it. My final picture is printed slightly less than 2×2 inches. Its more like 1 3/4 square. Does this matter? Thanks Nic. This is a great help when staff ask for a passport/driving licence/visa photo. Thank you very much for the template. Made perfect passport photos for my baby. and just wanted to thank you for the incredibly helpful template. Sending many blessings and well-wishes! Take care! Hi — Great tool — but I don’t find the ruler to be dragable (no matter how many times I hit the move tool), and when I drag the photo into the template it goes underneath, not on top of the template. What am I not doing right? Thanks! When i put my picture on greyBG, everything of pictures appears on the screen other than those area where grey BG has occupied. means grey deosn’t disappear when i put my picture on it. 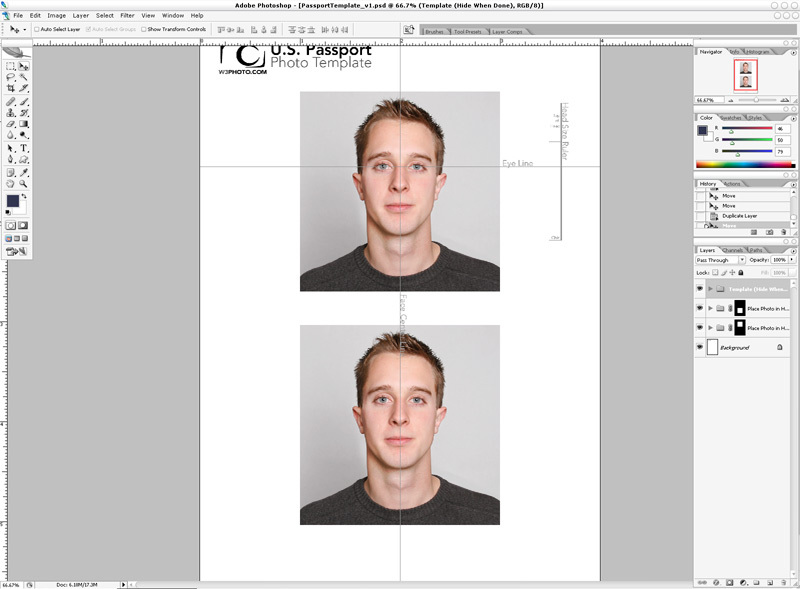 How your passport photo template can be modified to suit 35mm x 45mm passport photo? Just wanted to say thanks for this template. 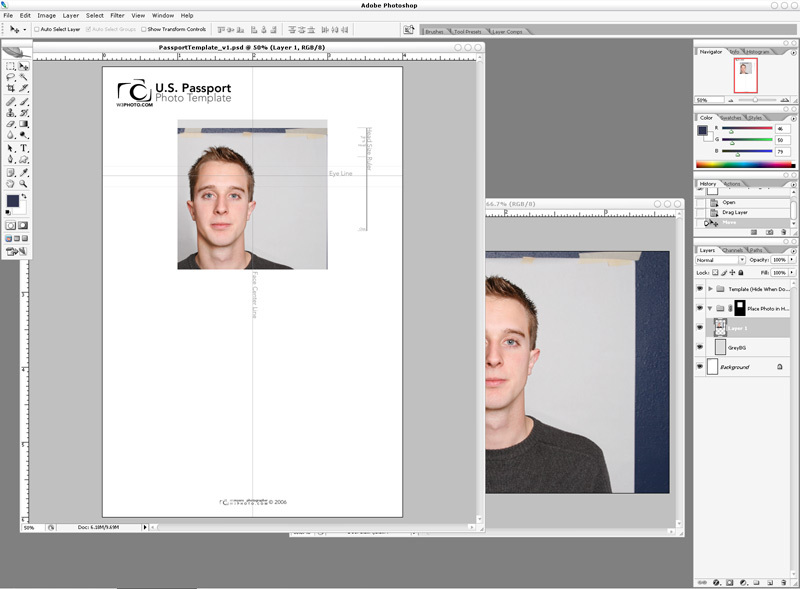 You saved my wife and I $120 because we need six passport photos each for visas for our upcoming travels! Thank you very much! It worked great! Many Blessings to you! Dude, put a donate button for this! Thank you so much! We were able to save over $100 using your template! Phew! Thanks so much for this! I was stressin out trying to figure the stupid head size and all that. You saved this new mom a headache! Thanks!!!! Thanks a lot. This made life so easy. Saved me some $$. I was looking for a donate option for personal use but could not find one. So all i could say is you are super generous and awesome. Thanks ! It works. I wasn’t able to follow the specific directions, maybe I have a different version, but it worked and for my husband and myself we just saved $30!!! Thank you for making my life easier! Cheers from Los Angeles. Thanks for having this available. Saved me a few bucks and was easy to use. Thank you so much for this template. It was a great help, when I needed a passport photo fast. The state dept DID accept it and I got my visa for China. I’m so happy to have saved the dough for such an Italy bitsy photo. The fellow at Walgreens who printed my 4 x 6’s (15 cents each) told me how particular the gov’t is about these photos and how many times he’s seen ” home made” ones rejected. He did say mine was pretty good compared to all he’s seen. He even cropped them for me with the square punch and put them in an official looking folder for me. My husband still doesn’t know I did the cheap route. He feels most comfortable with a for sure thing, but pays for it. thanks so much. this made it easy as pie! well this has not worked for me cannot get it to move photo.drag photo into template does not work either.will see if i can find a better template some of your instructions are not clear enough on what you have to do. Thanks a lot! This worked well and really helped. Thanks a lot! Made this easy! Thank you for making this template. Easy to use and works great! for picture and not my very attractive thunder grey back drop. Would like to send a little donation – any way to do that besides the $20/amount?